Modern sheds are much more than a place to store lawn mowers and old tools. They can add extra storage, be used for office or workout space, or make gardening even more convenient with a garden shed and potting table. In this article, we’ll be going over 35 shed ideas sure to inspire you to create an awesome shed design. Sheds are really fun and useful. You can build a shed from just about any materials. You can be handy and use scraps you already have laying around or you can buy kits with metal, plastic, or wood sheds that just need assembly. You can also just purchase roof kits or window and door kits. Part of the fun of having a shed is the design phase. You can make it whatever size, shape and color you want. You can pour a concrete foundation or use concrete pavers, deck blocks, or even pour gravel into a timber frame. The most important thing when creating a foundation for your shed is making sure that it is level. Then you just need to add the framing, siding, roof, doors, and windows. You can purchase ready-made options or use a combination of DIY and kits to build the perfect shed. 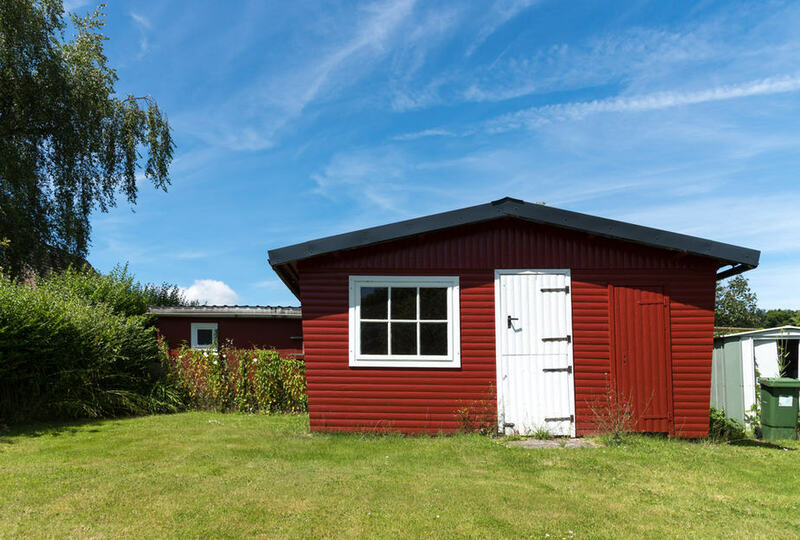 If you are going to use your shed for an office or another extension of your home, you will need to consider insulation, power, and heating and cooling options. 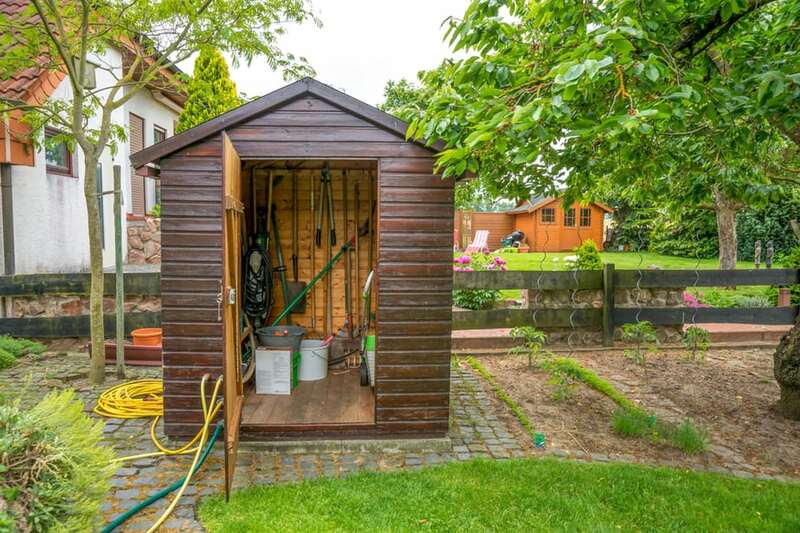 If it is just a tool or garden shed, you may not need all of this. Just a simple structure on a level foundation is all that is required. Whatever you are doing with your shed, dressing it up with paint, shutters, a fancy door, plants, or signs will go a long way to make it your own custom space. Sheds can be used for art studios, workout areas, play areas, a recording studio, or your own hideaway. This small green gabled garden shed made out of wood is the perfect addition to any backyard or English garden. The wood door is reinforced with Z-pattern boards and the lighter colored interior and accent colors set off the deep garden green. This is a simple, straightforward design with just enough room to hold all of your lawn and garden tools. 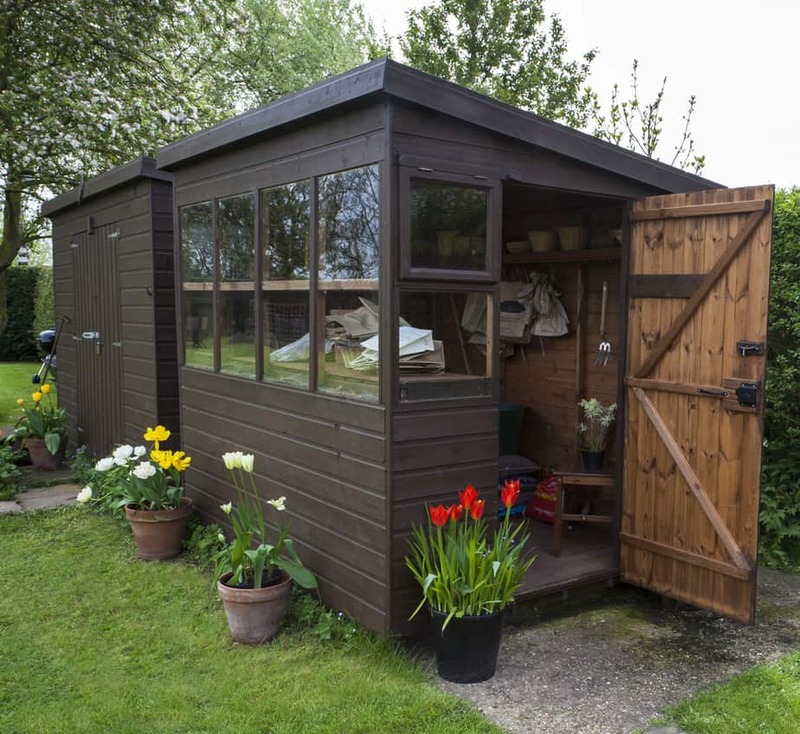 This large double-doored garden shed is the perfect choice to hold all of your tools or to create the perfect potting shed. It’s also big enough to be used for extra storage, an office, or a workout room. 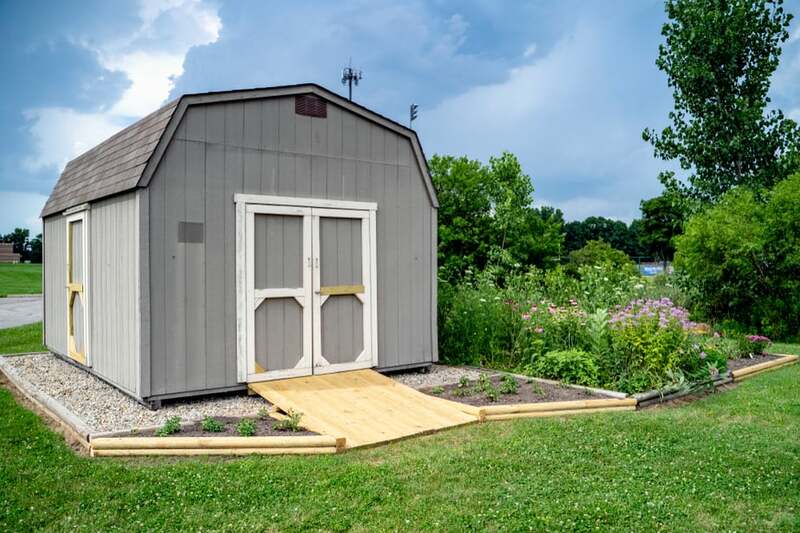 This decorative shed has a shingled roof, windows with attached flowerbeds, and two doors to allow maximum room for moving your things in and out. This shed would make a lovely addition to any backyard. It’s adorably cute with its shingled roof, trimmed door and windows, and a little porch. This would be the perfect shed for storage, a playroom, or backyard getaway. A shed like this can be built with the purchase of lumber and tools, or you can order a kit and then add the porch and decorative trim. 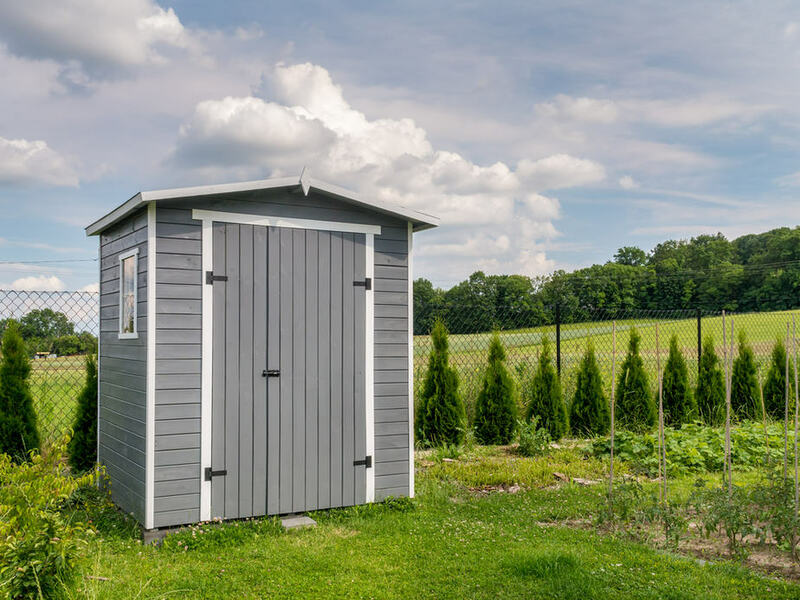 This gray garden shed with a large barn door is the perfect place to store all of your lawn and garden tools. This simple gabled shed sits on a cement slab and has gray trim around the door corners and fascia. This is a fairly simple and affordable storage option. 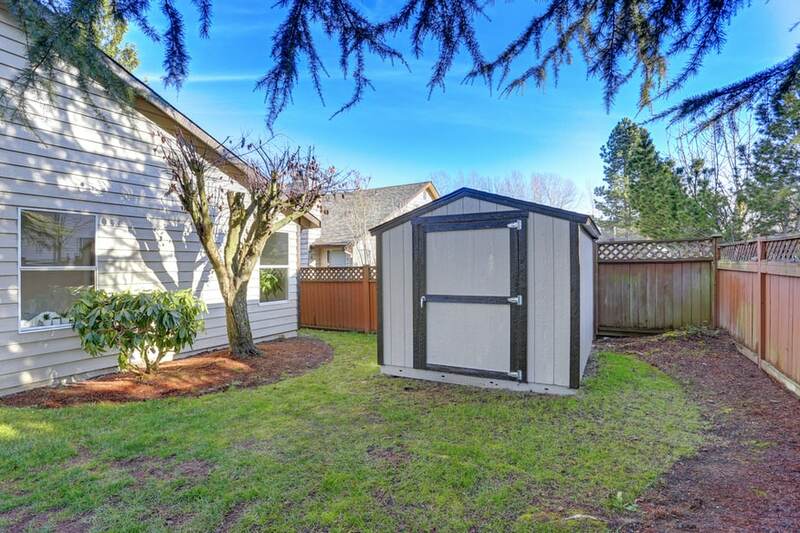 This tall gray storage shed is more like a storage cabinet. It’s set off with white trim and has windows on the sides. This is the perfect spot to store all of your lawn and garden equipment, along with whatever else you’d like to protect from the elements. 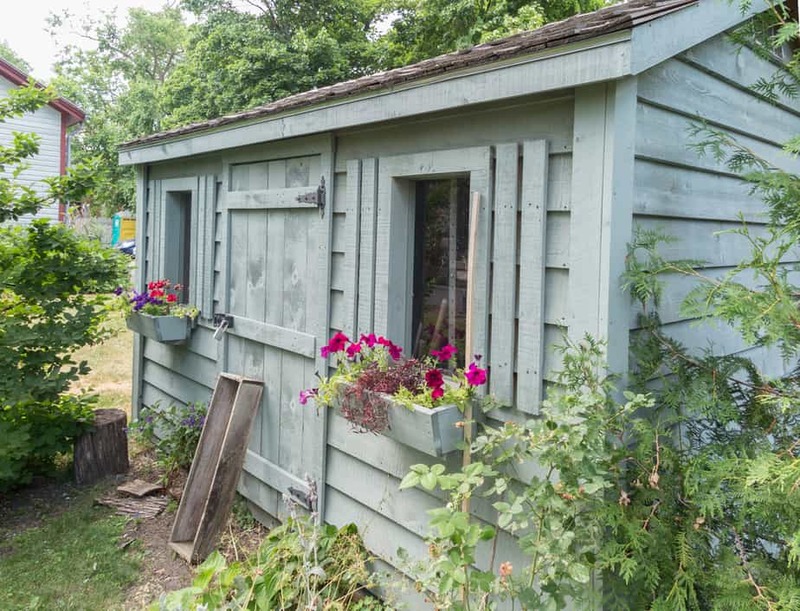 This gray-blue colored garden shed looks like a quaint little house. It has a gabled roof with shingles, windows with shutters and flower boxes, and a large door on the side. This would be the perfect potting shed for even the most ambitious gardener. It also leaves extra room for storage and is pretty enough to use as a playhouse, hideaway, or an extension of your living space. 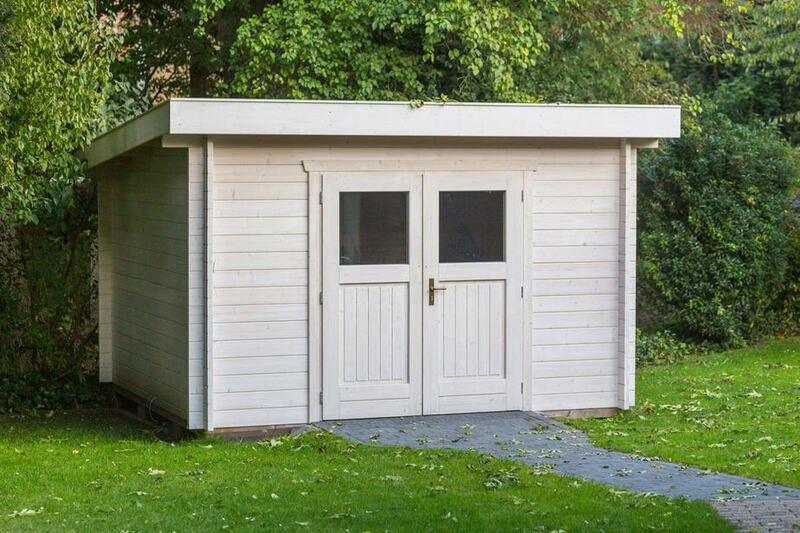 The dark stain on this wooden garden shed makes it a beautiful addition to any backyard or garden. It’s set on a brick foundation and has a wooden floor, as well as a large door which allows tools and other garden supplies to be easily taken in and out. Here is another natural wood-colored garden shed. This one is gabled with a shingle roof and a side door with a window on each side. The natural wood blends perfectly with the lattice fence and pergola gate. A great thing about this shed is that it will last for years and the weathered wood will only look better over time. This is a beautiful backyard addition. This large gray shed has double doors with glass windows on top. It also has a window on the side and is extra wide for a lot of storage. 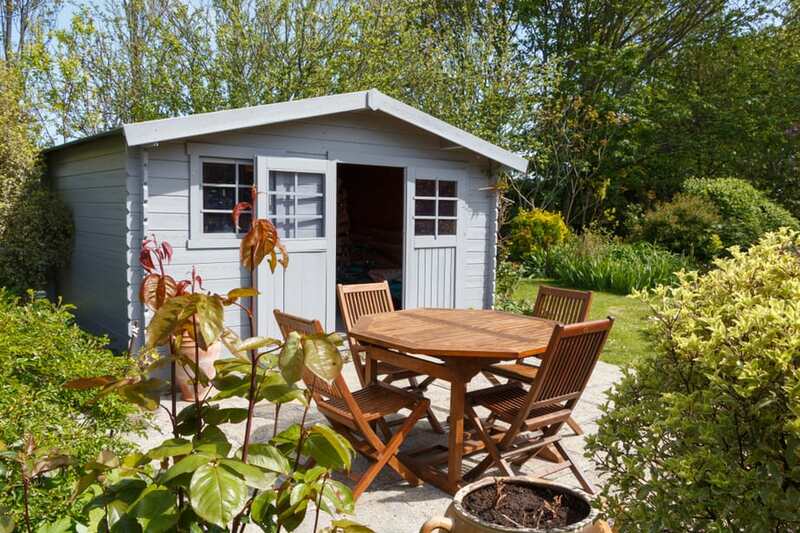 What sets this shed apart and makes it look extra cute in the garden is that it has its own patio with a table and sitting area. This shed is similar to the one above. The door and window configuration is a bit different, but what makes it really stand out is the bright red paint job with white door and window accents. This shed can serve as another room to your home or a huge storage option. Here are two modern-looking garden sheds using the lean-to style. Lean-to sheds are a simple and easy way to create extra storage space. This clever design has one shed with a large double door that can be used for the lawnmower and garden tools. There’s an additional shed right beside it with windows all along the front and a door on the side. The second shed can be used as a potting shed and work area with pots, flowers, and a table for planting new spring blooms. Both sheds are finished with a deep dark brown stain. This simple design creates a modern, dramatic look. Here is another lean-to style shed with double doors on the front. 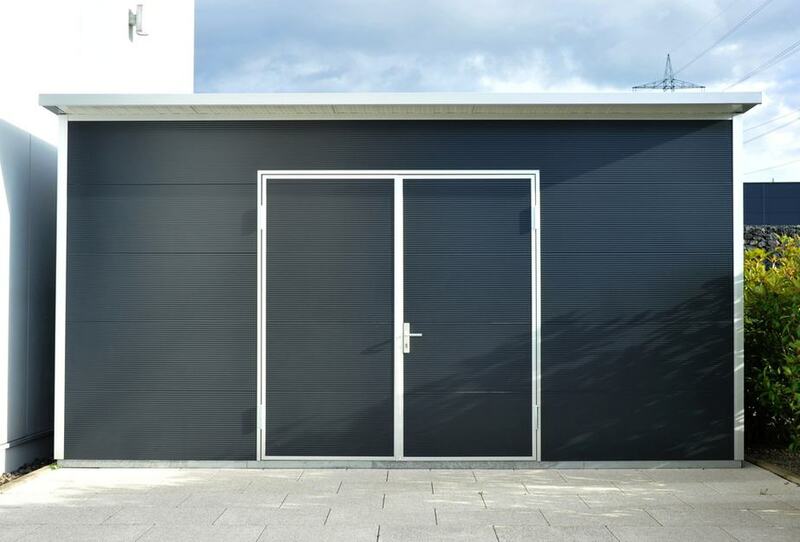 Creating a large storage shed using the lean-to design creates a dramatic, modern look at the edge of any garden. Window doors and light paint set off the look. This upscale storage shed is simple, yet has a dramatic dark color and white trim. The double doors open up to plenty of storage space to keep your main living area free of clutter. 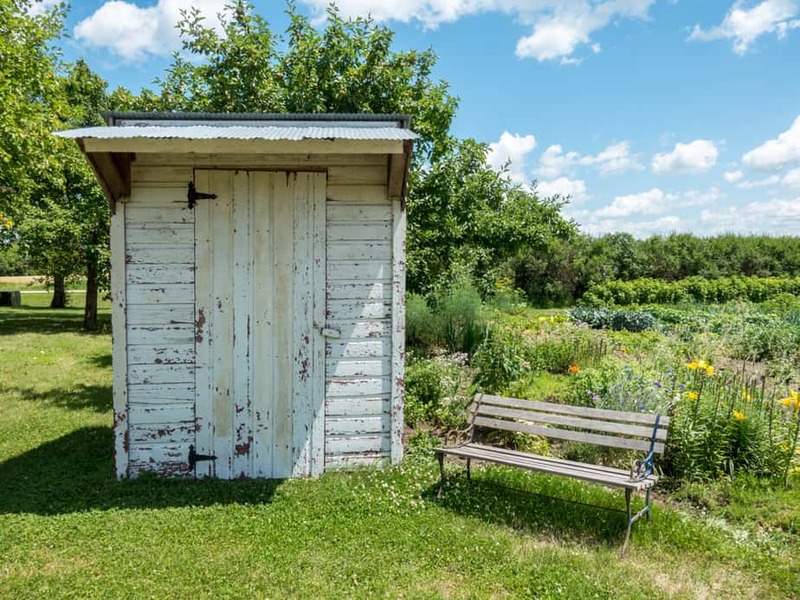 This rustic white storage shed has a fiberglass roof to keep the rain and elements away from the door while you’re moving your items in and out of the shed. Even though this shed is old and weathered, it looks beautiful against the lovely green backdrop of the fields and orchards. Here is a weathered garden shed tucked in the back of the yard near the fence. The weathered wood and gabled roof look lovely offset with the nearby climbing vines. A gravel foundation and potted plants create a whimsical backyard garden. This lovely shed looks like it’s sitting in the woods. It’s made with stained wood, a cute window with shutters, and a double door with a ramp for your lawnmower or tractor. The moss roof looks lovely against the green backdrop. Moss roofs are interesting because they do look lovely, but if they aren’t intentional they could damage a roof. Many homeowners try to prevent moss from growing on their roofs to avoid costly roof repairs down the line. There are also moss sheets that you can apply to a roof on top of a waterproof membrane for the look of moss without any of the damage. The roof on this small shed probably wouldn’t be that expensive to replace, and the moss does look pretty in front of the trees. This old wooden shed has withstood the test of time. It’s still doing what it’s supposed to do in spite of the years, the shrubbery, and the elements. 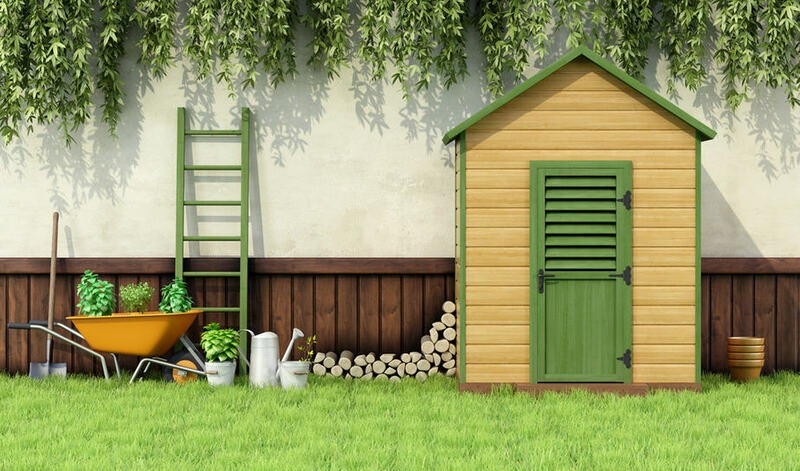 A shed that ages with your garden will look amazing for years to come. This antique shed has weathered blue paint and a window. It’s adorned with bird feeders and a heart on the door and has a little hedge in front of it blending in perfectly with the rustic setting. 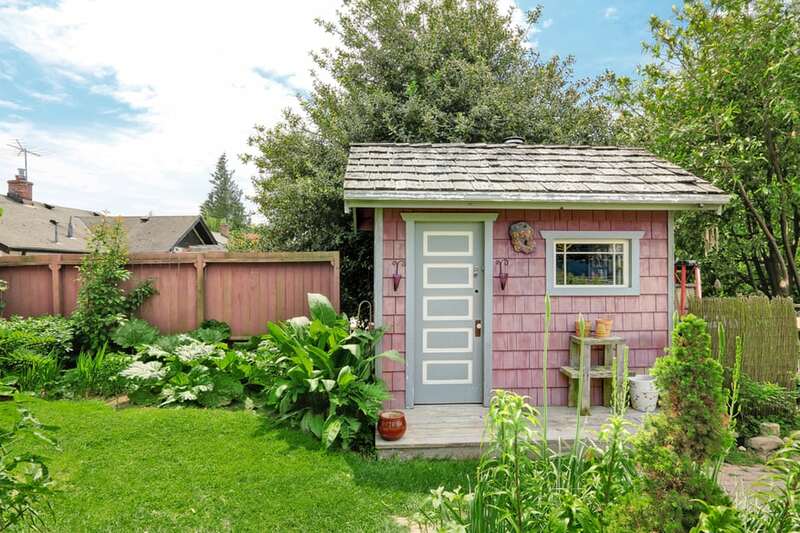 This is a cute storage shed which could also be a reading nook or secret hideaway. This rustic woodshed with large double doors is clad in tin. The tin is weathered and has taken on a purple colored sheen. 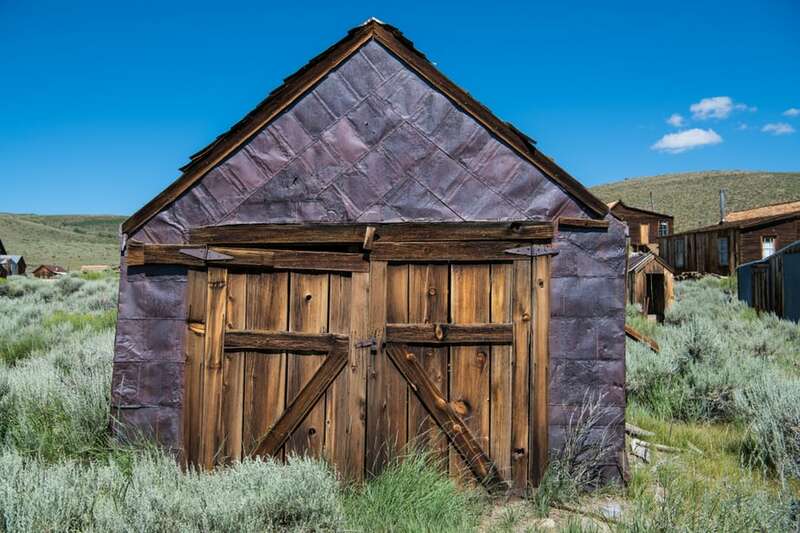 This shed truly is rustic because it is an abandoned shed in the ghost town of Bodie, California. Only history knows what was stored in this shed many years ago. This large stone shed could even be used as a small garage. It’s built out of beautiful stone with wooden doors and accents. The long, gabled roof is made from wood shingles. This shed would look perfect on an estate or rustic property. Who says your shed has to be on land? 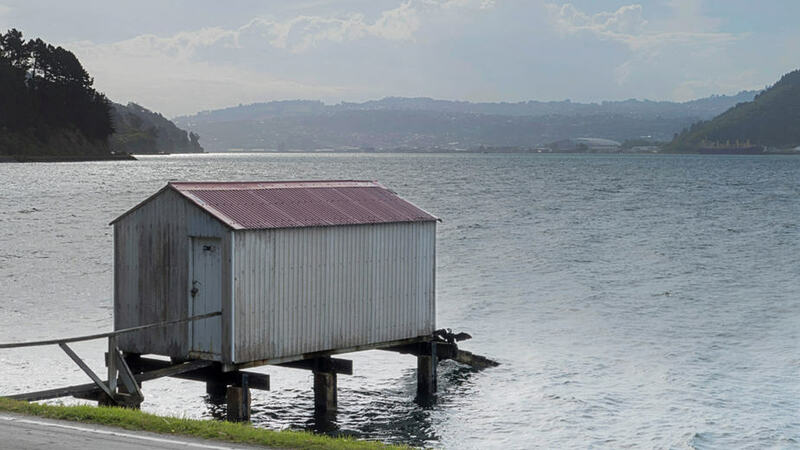 Here is a tin boat shed in New Zealand. The weathered tin will last for years as it protects generations of boats from the harsh elements of sun, wind, and water. 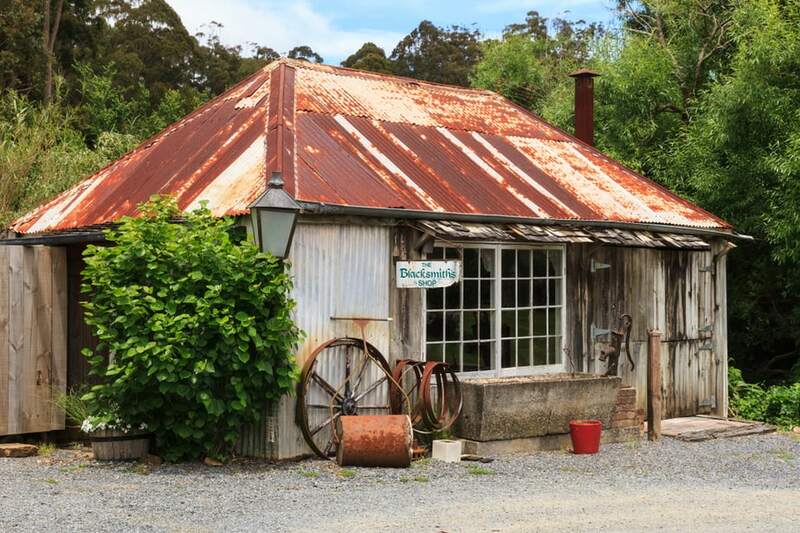 This old shed was used as a blacksmith shop. The tin structure is rusty and weathered but has withstood the test of time. It has a large front window and porch and a welcoming rustic look. 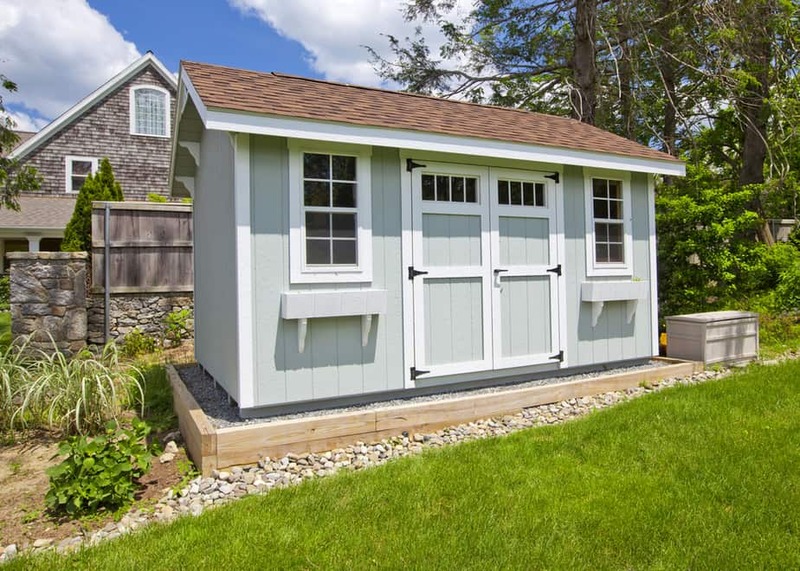 This cute shingled shed could be a garden shed, storage shed, or office space. The gabled roof has wooden shingles, and the siding of the little house has shingles painted red with a cement porch, and cute door and window. This adorable shed looks like a little house. This cute little shed looks like a tiny house. 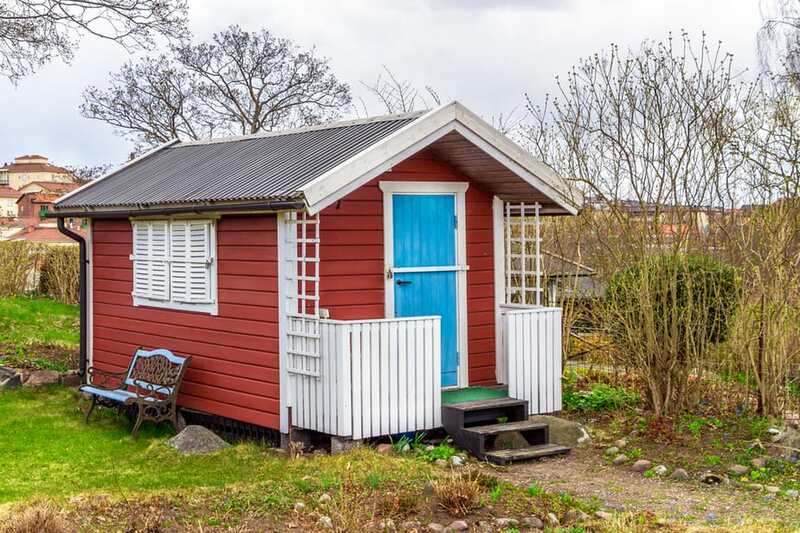 It has a tin roof, white shutters, the exterior is a traditional Swedish red with a blue accent door, and a little, fenced porch. This could make the perfect office hideaway or cute little storage shed. “She sheds” are real. This is an adorable example of a tiny “He Shed” and a larger “She Shed” being used as a portable storefront. This is a perfect example of how a shed can be used for any purpose that your imagination dreams up. This cute blue shed has a gable overhang with a decorative fascia over the front door. It also has a poured cement porch with a lounge chair and potted plants. This is the perfect example of a shed that can be used for more than just storage. 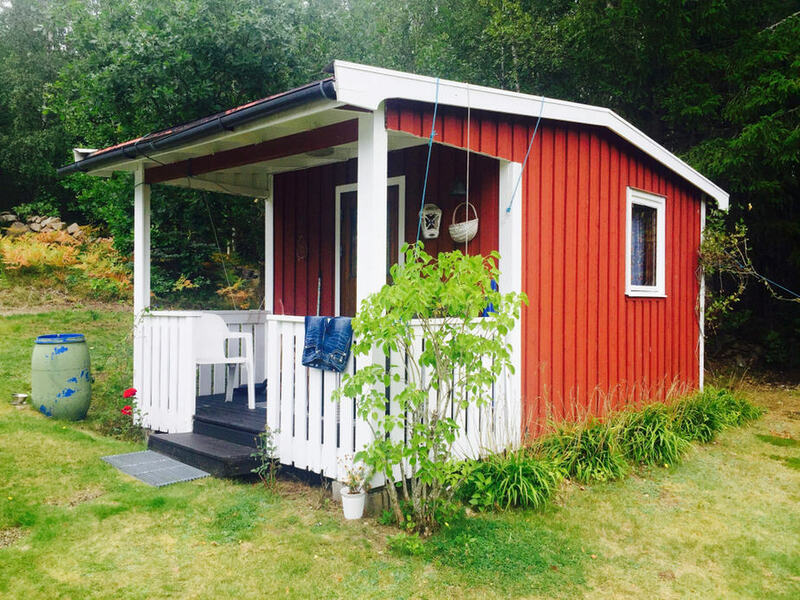 Friggebo is the Swedish word for a shed. A Friggebod is a tiny house that doesn’t need any zoning permits. The red color is a traditional Swedish red used to paint houses and cottages, based on the original Falu Red used in 17th and 18th century Sweden. Besides the multicultural history lesson, this is the perfect mixture of a ubiquitous shed that can be used worldwide for any purpose you can conjure up. 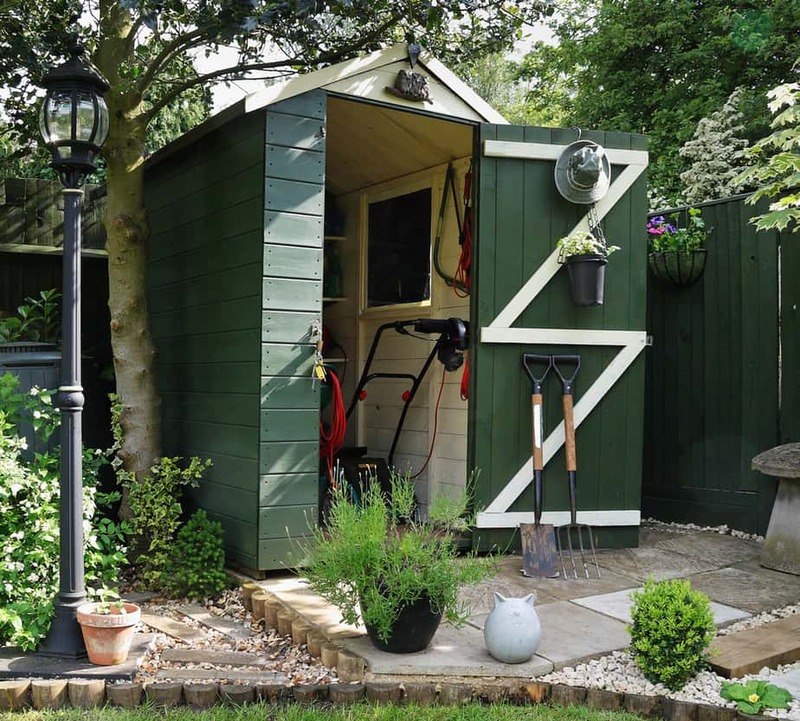 This is a clever example that combines a garden and storage shed with a woodshed. The dark, stained wood conceals a beautiful shed with a swinging door and window. On one side there’s a useful storage area for wood. This small, gabled shed is made from natural wood and has a sloping structure on the side to store wood and protect it from the sun and the rain. This is a simple, yet useful structure that looks great. What would make more sense than having your greenhouse attached to your potting shed? This is a perfect example of a cute little blue garden and potting shed with an attached greenhouse. This uses a custom design with a tin roof on the shed side and a glass roof on the greenhouse side. Everything is painted in a bright aqua color and white trim rounds out the classic look. Here is a perfect example of a simple garden shed with a greenhouse next to it. Both structures are simple, yet look really great in the yard. They also serve two distinct purposes for the ultimate in backyard gardening. This gray, barn-style shed with a gambrel roof has a rock foundation and a ramp for easy access for lawn mowers and lawn tractors. You can purchase a kit to create a large storage shed like this or build it with your own materials using simple plans. This open gable shed has large barn doors and is painted barn red and has a ramp for easy access for people, tools, and equipment. This is a simple and cute shed that you could put in any garden or outdoor area. 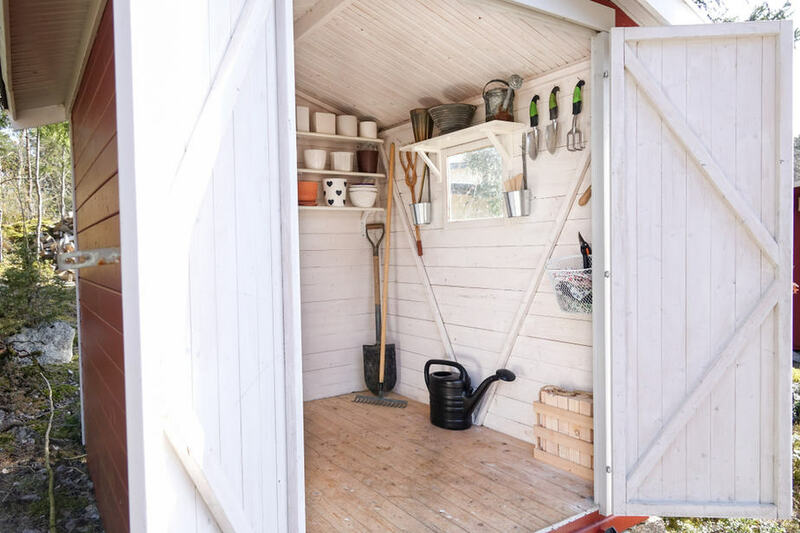 This garden shed has a wooden floor and a bright white interior. It has shelves for added storage organization and hooks for small and large garden tools. 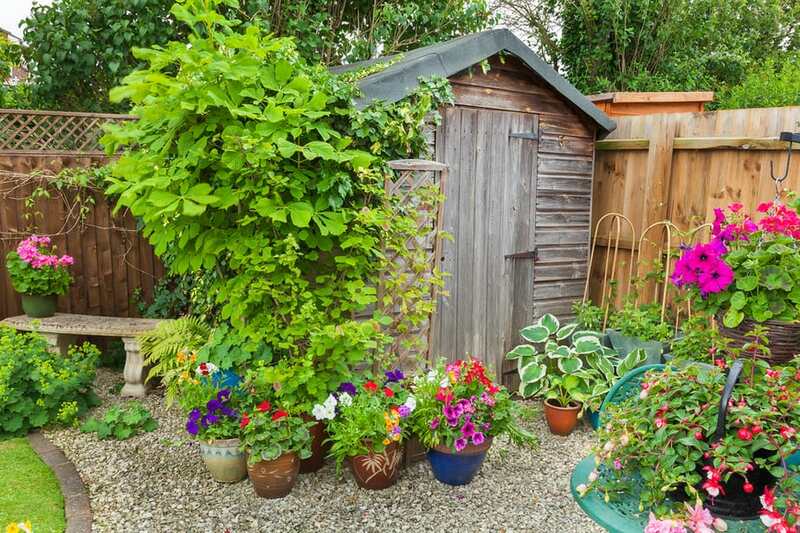 This is the perfect example of a neatly organized and roomy garden shed. Here is the inside of a natural-wood shed with plenty of hooks for garden storage. You’ll never have to search for tools again with everything neatly displayed and accessible. This also has a wooden floor for a rustic appearance, and easily maintained style. A shed is an amazing addition to any area. It can be made out of any materials, and the more rustic the better with today’s design tastes. You can use your shed for storage or as a place for tools, but you can also get creative by making a yoga, art, or craft studio in your shed. 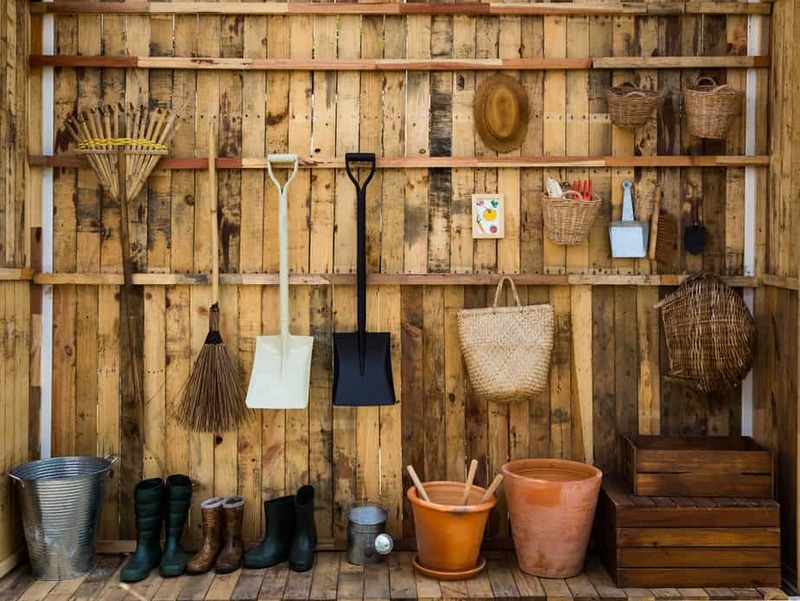 Additionally, sheds can be used to store bikes, outdoor game items like a bocce ball set, canoes, or things you want to protect during the winter like a smaller-sized trampoline. You can customize it with painted shutters, antique doors, outdoor furniture, cute signs, rope lights, or whatever you can dream up to make the perfect shed for you. Hopefully, you were inspired by these shed ideas and can begin working on transforming your yard!